My current storage of detailing products is a hodgepodge of plastic storage bins on wire shelving carts and/or other carts, three Systainer T-Loc containers on a mobile base, and buckets with gamma seal lids. 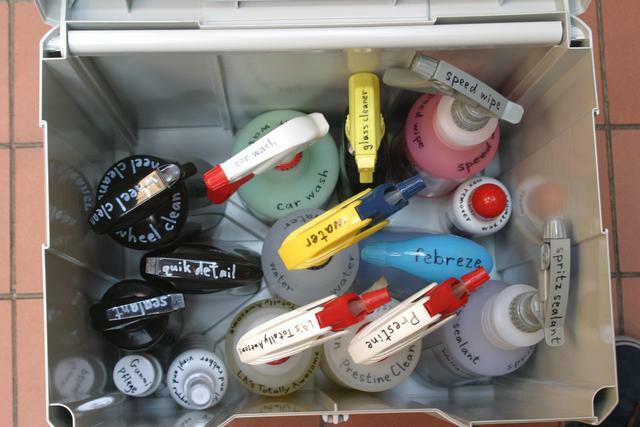 I am planning to migrate more of my supplies to Systainers T-Loc containers. Yes, they're pricey. However, they're durable, they're easy to move more than one at a time (if not too heavy or if on a mobile base), and they provide effective dust and splash protection. To me, it's important that my detailing storage does not easily permit dust to reach the contents. It makes no sense to own and use good quality microfiber buffing towels if I let them collect dust between uses. Many bins provide reasonable dust protection, of course, especially if the bins are stored in a fairly clean environment. But if they're sitting in a garage or workshop area that sees sawdust, sanding dust, grinding dust, paint overspray... I want to be reasonably sure that dust can't easily get to my towels, polishes, sealants and waxes when their storage bins are closed. I've had some luck with the typical big box store bins from Sterilite and others, but over time they tend to break (locking handles, locking tabs, the bins themselves if dropped or used in bitter cold conditions). Even when they don't break, the lids do not fit snugly around the entire perimeter and hence they allow airborne contaminants to get inside. The significance depends on the storage bin, the bin's contents and the contaminant(s). Being able to easily move my storage without consuming space on my work cart is also important. I like having my work carts relatively free of cruft when not in use, so I can grab one to work on something at a moment's notice without spending time unloading things to make room for what I need. If there's something on my tool cart, I'd prefer it's something I'm actively using, not something I left sitting there a month ago. Obviously, rust resistance is important; we're talking about storage that's going to hold some fluids and will get wet with water and chemicals. Ideally, the storage has little to no metal. The Systainers fit that bill nicely, and while the mobile base obviously has metal in the casters, the base itself is plastic and the Systainers are all plastic. No dimensional stability issues with moisture, and no rust. Weight is also important. I want to be able to move all of my detailing stuff quickly and as effortlessly as possible. I don't want to add to what can already be heavy at times (fluids). 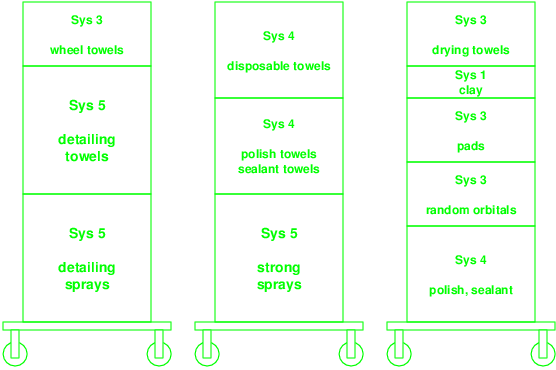 The Systainers are lighter than the equivalent metal or wood containers. The Systainer mobile bases have high quality casters for the price, they roll effortlessly when loaded. My only complaint about the mobile bases is the rubber straps that hold the bottom Systainer to the base. They're a bit flimsy in use; the Systainer stack can sometimes slide on the base and pop out of the rubber straps. It's the one flaw in an otherwise well-designed product. The gamma seal lids on my buckets allow them to be used as sealed storage. While cylindrical storage is not space efficient, I need buckets for detailing and I might as well be able to use them as dust and moisture resistant storage. Plus I can stack them, sit on them (on the gamme seal lid with or without a cushion), and of course put them on PailPal bucket dollies. Thay're also not terribly expensive. My current plan for Systainers is shown in the crude diagram below. The parts in bright green are those I now own. Thanks to my sister and mom for some of the bins they gave to me on Christmas 2012, and to Julie for the rolling base she gave to me. My first stack of Systainers is a pair of Systainer 5 T-Loc and a Systainer 3 T-Loc on a mobile base. The bottom Systainer 5 T-Loc holds my most frequently used sprays. Worth noting in the picture below: the new style of Griot's sprayer on the Spray-On car wash bottle versus the old style Griot's sprayer on the LA's Totally Awesome bottle and the Prestine Clean bottle. The new sprayer is junk compared to the old. But also notice that the yellow and navy Zep sprayer for water is the same as the old Griot's sprayer. A downside is that the Zep and old-style sprayers are tall, which means they won't fit in a Systainer 4 when they're on a necked 32 ounce (1 liter) bottle. It's a non-issue with the Systainer 5. The other Systainer 5 T-Loc holds my most frequently used microfiber towels: towels for spray-on car wash and detailing spray, towels for glass and towels for spray sealant. The Systainer 3 T-Loc on the top holds towels for wheels, undercarriage... the dirty jobs. My next stack of Systainers will hold strong sprays/cleaners and more towels. My third stack of Systainers will hold drying towels, clay, random orbital pads, electric random orbitals, polish and sealant.